Those in the know fully understand that CNC routers are fantastic machines. They allow the user to bring life to their designs very quickly indeed. 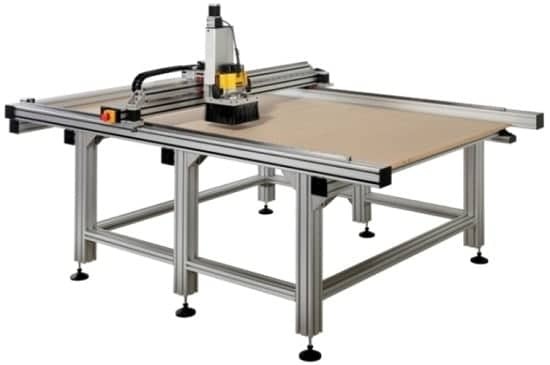 A good CNC router offers precision cutting with speed, and these days at a very affordable price. 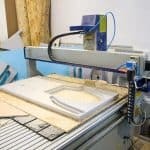 So what is the best CNC machine for home or small workshop use? That’s exactly what we will look into today. In this article we have taken an in depth look at 5 excellent tools. For our findings at a glance, just turn to the table below. 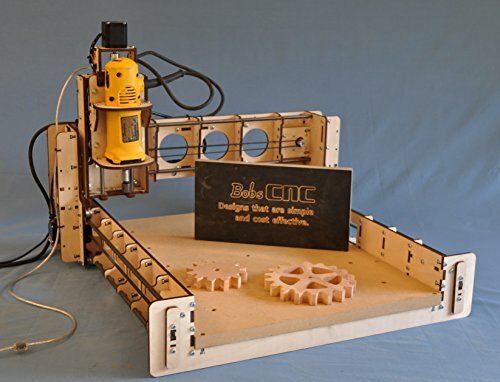 For a review of each CNC router, plus a dedicated buyer’s guide, keep on reading. The CNC machines you find on the market today combine a system of computer controllers and software in order to guide the router. This gives the user utmost precision and allows for the careful planning of a cut before it is executed. In short a properly configured CNC router will allow you to execute near perfect cuts or engravings. However, like anything else, there are a number of models and manufacturers to choose from. Knowing which to opt for can be difficult. To help you, here are a few things you should consider before you make your purchase. There are several questions you should ask yourself first. For example, what are your expectations for the router? What is it you are trying to achieve? This will help guide you to the type of machine you should buy, along with the required capabilities. In short you need to be sure the machine is capable of achieving your expectations. Rack and pinion is the more common system on entry level routers. The ballscrew drive system is still available on smaller machines, however they are generally more expensive. On the plus side you can expect the ballscrew router to withstand larger material sizes as well as be more accurate. Look out for servo motors if possible. These are better for higher speeds, they also provide greater torque on applications involving continuous load changes. You may also find that your tool of choice uses a stepper motor. These are less expensive than servo motors and are better for low to medium speed work. A great feature to look out for (especially if what you are working on requires tool changes throughout), is a built in ATC System. This will make your work more efficient. You will work faster, reducing job times as well as the chance of operation error. Table size is important and should be considered in line with the types of work you plan on carrying out. It is clear if you will be using large materials with the CNC machine, you will need a table that can accommodate the size. It is also worth considering the ease with which you can adapt the table (or machine) as your demands change. A CNC router that allows for expansion, or has built in ability to handle varying material sizes is definitely a benefit. 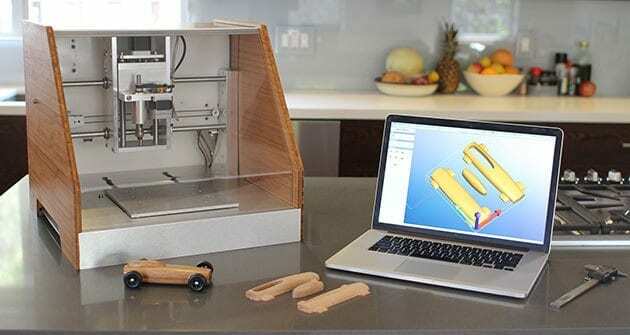 The majority of the machines in this article are CNC routers. This is because router cutters are more affordable than spindle based ones, and are therefore better suited to the smaller workshop or home based use. However, it would be remiss of us if we didn’t at least take a small look at the differences between the two beyond that of cost. In essence a high frequency spindle is better for heavy production situations. They are known as the industrial grade solution CNC tool Power normally comes from a 3 phase set up (which means it needs to be routed through an inverter). The spindle packs a greater punch as a result, with far greater torque at much lower RPMs than what you can expect from a router. This coupled with the fact spindles are built with precision bearings, means that the CNC machine will offer smoother, more accurate cutting. Durability is also a factor; the components are designed to last longer under continuous use. So, that’s a lot of benefits for a spindle based CNC machine. However, you will have difficulties finding one under $1500. 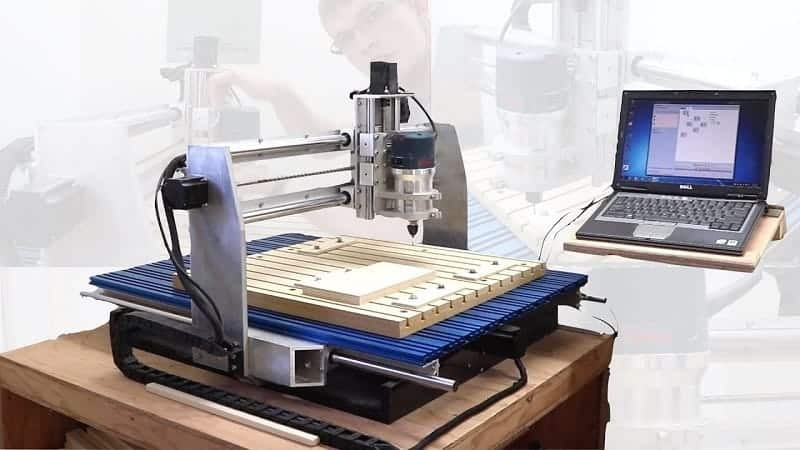 On the other end of the spectrum, not only is the CNC router more affordable, some kits will allow you to upgrade to a spindle if and when you choose to do so. 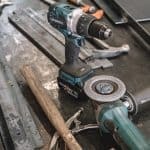 The bottom line is, if you do not aim to be doing heavy-duty, commercial grade cutting and noise is not an issue, (routers are a lot louder than spindles) then the router CNC is the far more logical choice. A very big consideration when buying a CNC machine is software compatibility. If you have already decided upon the design software you wish to use, you will need to ensure that your machine of choice can run with it. This means understanding what operating software the machine uses. These details should be fully explained in the marketing copy as well as online manuals and instructions. So, before you buy, make sure you have had a good look at these specifications first. The amount of extra features you can expect to find on the machine will depend on the brand and the overall cost. Here are some good additional features to look out for. While none are deal breakers, it is nice to have them. An important feature on any CNC machine is the way in which it holds the work material in place. For reliable cutting the material has to be held firm. Any slight deviation during the cut will lead to lacklustre results. Some CNC machines will feature additional components that can be used to screw or clamp materials firaily into position. There are also those that utilizes a jig or bleeder board powered by a vacuum to hold everything in place. Vacuum systems have different hold down strength. The stronger this is, the heavier the material you will be able to cut. Look at the specifications to see how much vacuum pressure the machine has; how does this compare with competitors? 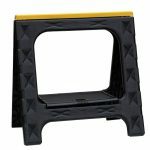 Just how securely does work material hold in place? Vacuum systems will also be able to keep the work area clean. This is important for precision, fault free results. Check your chosen CNC router to see just how dust collection is carried out. What kind of power an dust storage capacity does the machine have? Are extra components required? Finally, before pulling the trigger on your purchase you should research what kind of maintenance issues and upkeep will be expected in order for the machine to continue working as it should. Will you be able to look after and service the machine yourself, or will outside help be required? What sort of warranty and after sales service does the company offer? This will vary between manufacturers, so it is important to be fully clear on this before you make your decision. 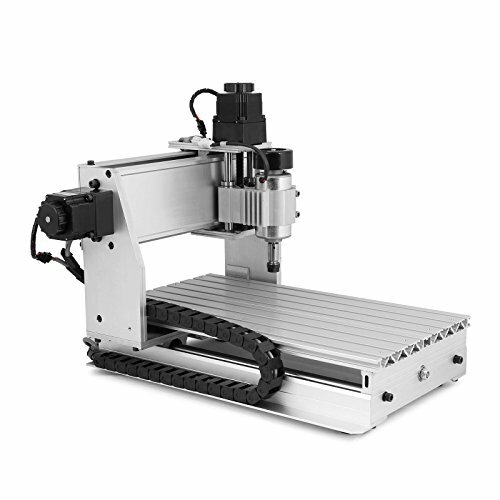 Now we come to the in depth reviews of each of our top 5 pick CNC routers. 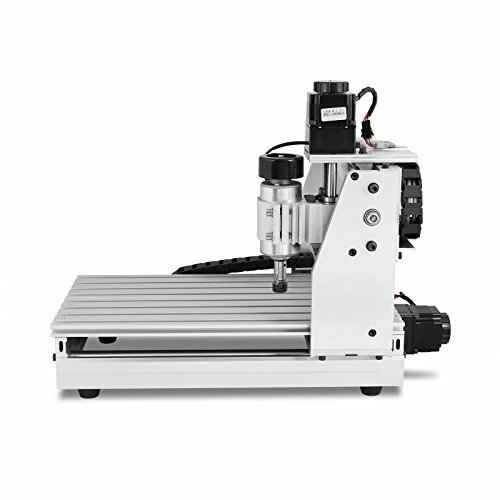 As stated above, we have focused on the best home CNC machines for this round up. The following routers are ideal for small workshop use. 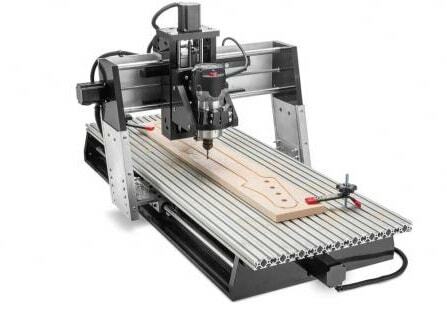 This is fairly the top option on this list of best CNC router machines. This is the most trusted and praised CNC router by customers on the market and it outperforms the rivals by a great margin. From packaging to customer support, the company puts commendable effort in all areas to make the customer experience truly amazing. 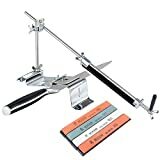 This machine can be easily assembled and used even by people who are just beginners in the field of carving. In case people face any problem, they can contact the company and immediately get solutions regarding anything concerning the machine. People can download manuals and get a lot of useful information about setting and operating the machine at the company’s website. This machine has commendable design and comes with a warranty of 30 days for any manufacturing defects. 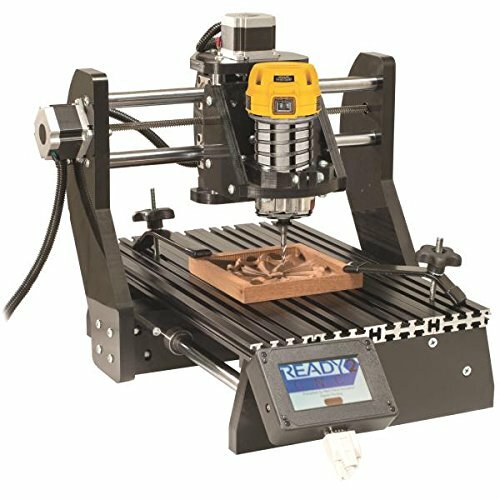 The machine sports a rigid frame cut with laser and dual brass nut on the Z axis which make it strong and sturdy for long operation. This CNC router is made in USA and is shipped within a few days to the customers. The machine is 25x19x25 inches in dimension which allows to be placed easily along with the computer and other accessories on the work table. The machine’s weight is only 28 pounds which makes it extremely lightweight as compared to other options. The machine features a wide work volume with 450, 390 and 85 millimeters on X, Y and Z axes respectively. This allows users to work with large work pieces comfortably. The machine can run at up to 30000 RPM with 5 Amperes of power which is considerably larger than the conventional CNC routers which only have an RPM till 8000. The powerful motor allows it to cut through harder materials like butter when right cutting tool is employed. Although this machine is slightly more expensive than other China made products on the market, its performance and durability more than compensate for its price, making it in our opinion the best option in CNC router machines. 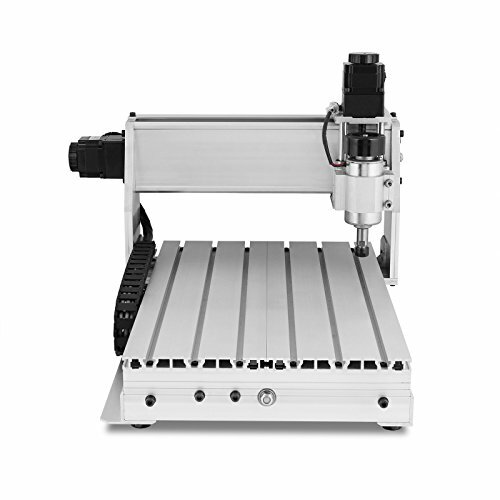 This is the best choice for people looking to buy a CNC router machine. With great customer support and performance, this machine also offers the best features to customers. This machine can be used to smoothly cut through a large number of materials quickly. 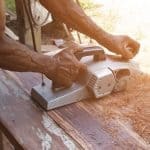 Accompanied with a wide work space, this is the perfect option for all types of carving enthusiasts even if they have no prior experience in this field. 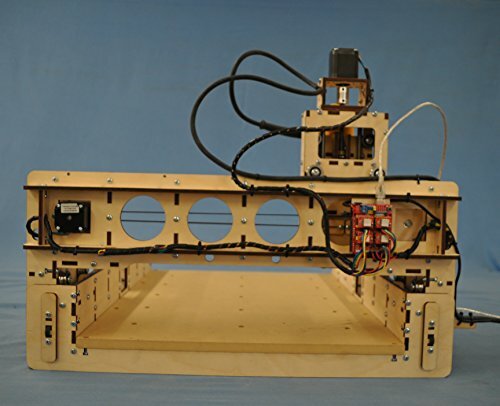 This CNC router is extremely capable and defies its size in its usability. This CNC router comes with a 12”x18” work table along with a color touch screen which makes it one of the best choices for conveniently performing small scale operations such as carvings, plaques and other projects. This machine can work precisely with wood, plastics and soft metals while it costs only a fraction as compared to full scale CNC machines. 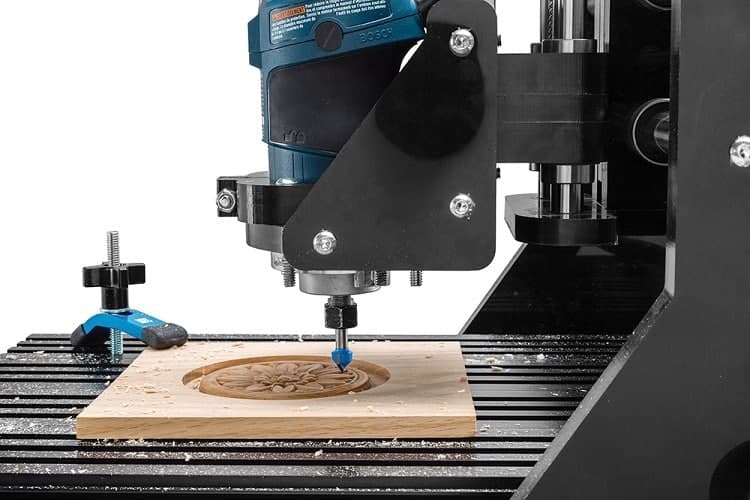 The 3D carving capability of the CNC Piranha FX allows comes along with a 3D library and allows the users to cut out intricate shapes and engravings without hassle. The accuracy of this machine is so great that it can be used to engrave customized circuit boards as well. 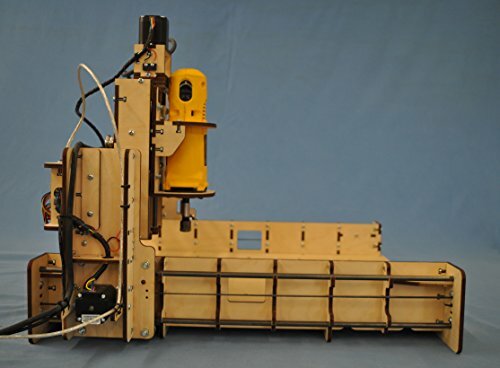 The compact CNC router can be easily mounted on one end of the bench while giving the user enormous potential for creativity. The CNC Piranha FX comes along with the VCarve Desktop V8 Design software which can be run on the computer to create the required designs on the work piece. The program can simply be stored on a USB drive which can then be connected to the machine for getting the desired model. This helps the users greatly in case they wish to keep their computer away from the dusty workshop. The work volume of the machine or tool travel on the X, Y and Z axes (directions) is 12”, 13” and 3” respectively. The machine comes equipped with slotted table track made from aluminum, which can be interlocked to allow customized clamping. The machine also comes along with Vector Art 3D Sampler pack which further increases the functionality and accessibility of the machine. 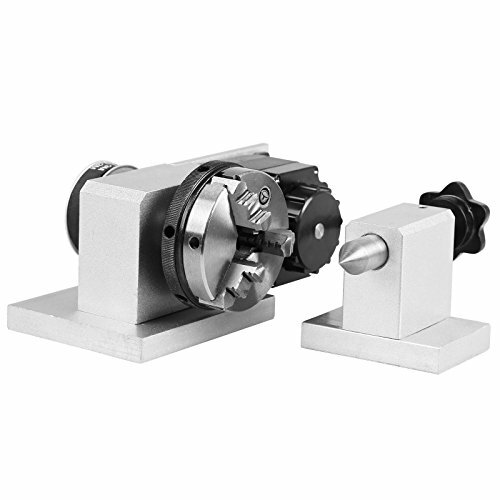 The CNC Pirahna FX has a strong built and is made out of durable metals. Even though it is not designed to cut hard metals, it can be used with a wide variety of materials using the right type of cutter. This last point being important; despite the overall cost of this machine it does not come with a router, you will need to buy this separately so ensure you factor this into your purchase decision. Overall, this is a small and efficient machine, which can be used comfortably by a wide audience due to its great functionality. The ability to remotely program the CNC Piranha through a computer and be instructed through a flash drive makes it extremely convenient. The availability of a color touch screen further makes it easy to be used even by people with less experience of operating similar machines. This is another great option available on the market at a reasonable and affordable price for carving enthusiasts. This small sized machine is capable of being connected to the computer like any other device such as a scanner or printer to increase its functionality. The machine features a strong and steady structure for support and chrome shafts which do not deform easily making it more durable. 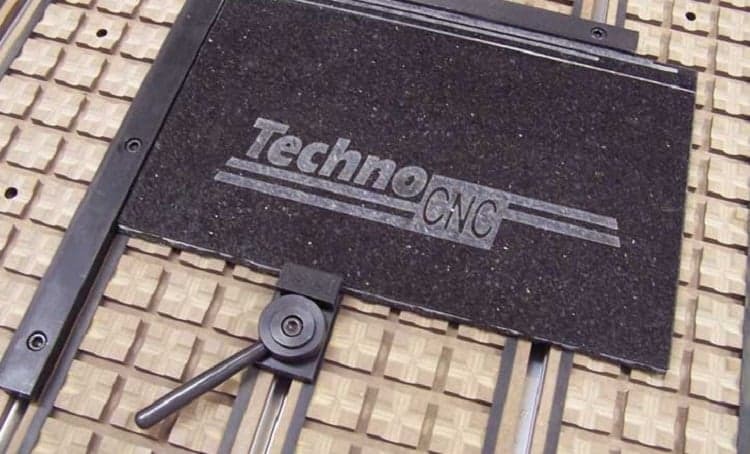 The CNC router machine is a good choice due to its quick coordination and fast results. The machine has a work travel of 275, 385 and 60 millimeters in the X, Y and Z directions respectively while the shape dimensions are 610x480x400 millimeters. The wide range of work travel allows the user to carve out a wide range of designs easily. This machine supports a work piece dimension of 70 millimeters which is ample enough considering its compact size. 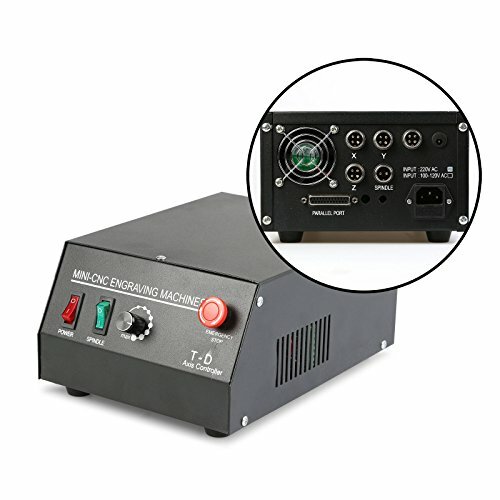 The machine uses a stepping motor of type 57 two-phase with 1.8 Ampere current. The spindle motor is of DC type with 230 watts providing a speed range of 500 to 8000 RPM per minute. The high speed and adjustable motor helps in getting smooth cuts quickly and efficiently with different types of working materials. The machine sports a principle axis collet of ER11 by 3.175 millimeters which can hold a variety of work pieces comfortably. The repeat accuracy of the machine is 0.05 millimeters which makes it a great option for making similar pieces effectively using the same code. The spindle also comes with great precision of radial beat at 0.03 millimeters. 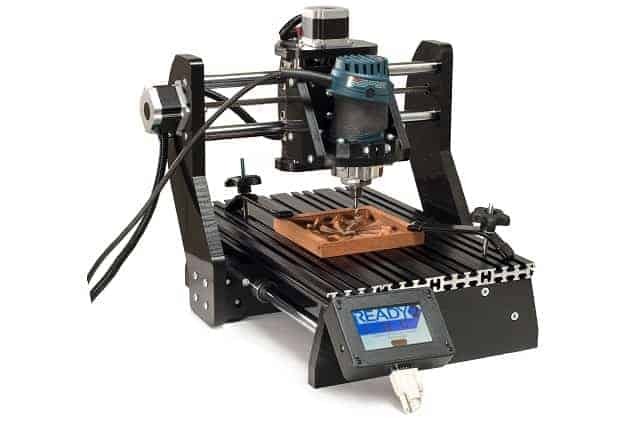 The CNC router comes along with software which can be used for quick programming and operation without the need to search or install other programs. The machine also has a maximum speed of 4000 millimeters per minute with a carving speed varying from 300 to 2500 millimeter per minute depending on the material being carved. The high speeds ensure quick results as well. The machine is convenient for being used at home and weighs only 28 kilograms. The machine can be connected to the computer using a USB port and is accepts commands in the conventional G code. The machine works well on Mach3 and EMC2 software. This machine also comes equipped with an emergency button for increased protection in case of hazards. A spindle motor knob is also placed on the machine for fine adjustment and accurate positioning. Overall, this is a good choice due to its efficiency and wide range of adjustments. Although it needs to be connected to a computer in parallel, it works really well and occupies very less space on the work table. The sturdy frame and strong materials provide it with a long life as well. 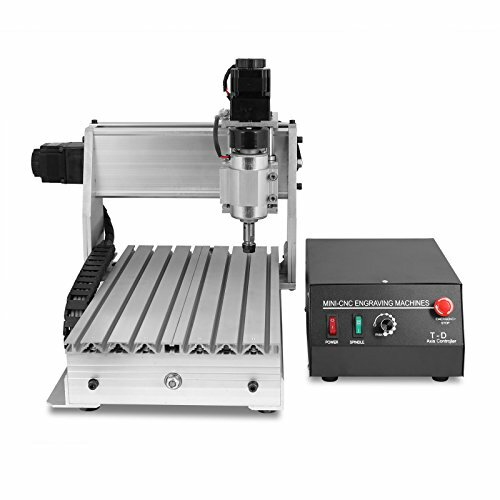 This CNC machine is a good option due to the fact it can be easily setup without much expertise through the detailed instructions provided in the manual. The machine also comes with easy to use software and can be employed for a wide number of purposes, (bare in mind the following compatibility specs however, the machine works with Windows 2000 / xp, win7-32 bit and win7-64 bit). 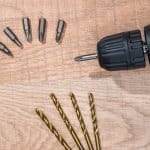 This machine has been designed to engrave a wide range of materials using spiral flute bits; including metal, steel, MDF board, solid wood, composite board plywood and stone. The machine has good work table dimensions and a work space travel of 200, 300 and 65 millimeters for X, Y and Z directions respectively. The machine frame is made using reliable alloys of aluminum which makes it quire durable. Motor speed the top end come in at a very respectable 8000 PRM, (lowest is 300rpm). The machine also supports standard G-code files, such as *nc,* tap and other tool path files instructions making it easier to operate according to the requirements of the user. This machine can be effectively used for a number of purposes and is a great choice for people looking to make intricate and different designs. This machine comes with detailed manual and is easily operable without much practice needed. 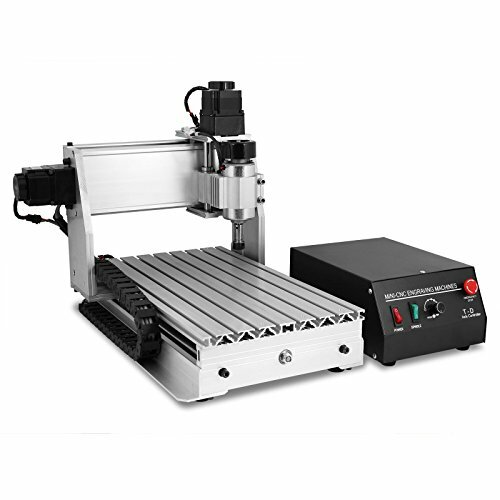 This CNC router supports G Code and has good built quality making it extremely versatile and sturdy for being used in a number of sectors effectively. 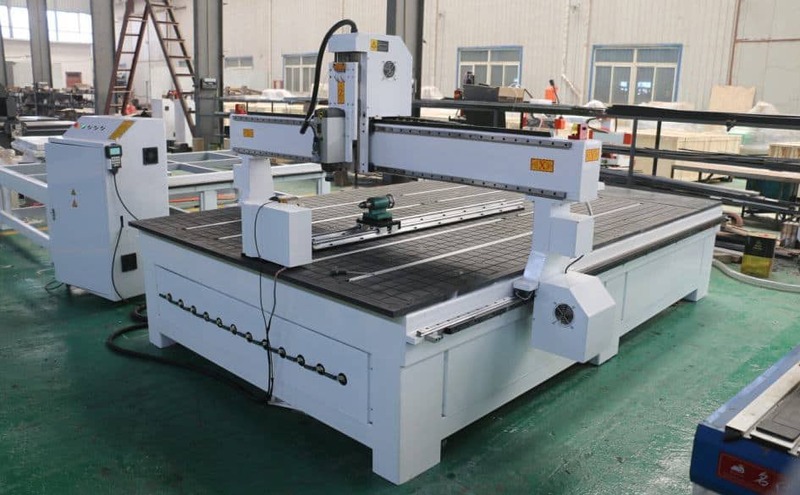 This CNC router is a good choice for people who are looking to work with larger number of materials and it can even be used with aluminum and brass comfortably. This machine is useful for a number of purposes including jewellery making, advertising or being used in workshops for cutting, carving, milling and engraving purposes. The machine has a strong build and is certified by ISO 9001 standards. The machine provides a work space of 200, 300 and 60 millimeters in the X, Y and Z directions respectively. Although this space is ample enough to complete most of the small scale operations, the company offers customers with an option of increasing the Z axis travel length by contacting the company before placing an order. The machine has a compact size of 47x39x38 centimeters which allows it to be ideally placed on the work table without using up much space. The machine also has a light weight and can be assembled easily. It is also quite strong and durable owing to its well-designed frame and strong construction materials. 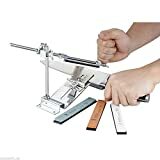 The machine has a resolution of 0.05 millimeter and a max moving speed of 4000 millimeters per minute which allows it to create sharp work pieces quickly and smoothly. The machine is also favored by customers due to its silent and hindrance free operation which is usually not the case with conventional CNC router machines. The machine can be connected to a computer using a parallel port and accepts instructions through the conventional G code. 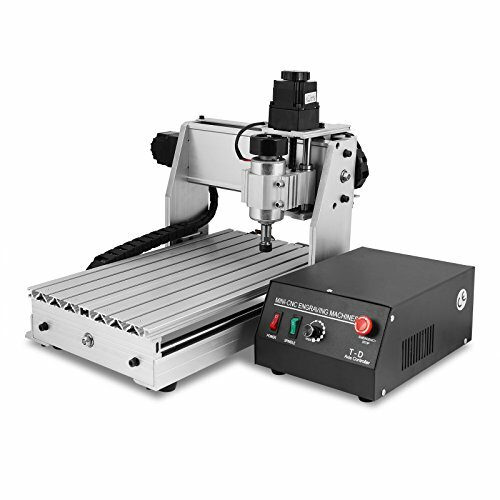 This machine is made in China and is thus priced at a very affordable rate in comparison to other CNC routers. Although products from China may sometimes be of unsatisfactory quality, this machine poses no such problems and is appreciated by customers for its durability. The products are also shipped quickly along with reliable and quick customer support from the company. This is the perfect option for carving enthusiasts who have a low budget on their hands and want a machine that works well and supports a large range of work materials. The option for customizing the Z axes work length further allows the customers to order the machine as per their needs.